(Chicago) – The majority of people who enter the justice system have a substance use or mental health condition, or both. In many cases, deflection and diversion to appropriate services can happen at the very front end of the system, even before arrest. TASC and its Center for Health and Justice (CHJ) are active in a number of national initiatives to advance knowledge, policy, and practice to divert eligible participants away from the justice system and into appropriate services in the community. Passed by Congress and signed into law in 2016, the Comprehensive Addiction and Recovery Act (CARA) is groundbreaking legislation that, among its many provisions, supports justice diversion practices, medication-assisted treatment, and naloxone for first responders to help curb the opioid overdose epidemic. TASC played a leading role in the bill’s inclusion of the first-ever Congressional authorization of funding for pre-booking police deflection programs. TASC and CHJ are partnering with the Addiction Policy Forum to help advance these innovative practices. TASC’s Jac Charlier and Phillip Barbour are featured in a 14-part video series entitled Medication-Assisted Treatment in Drug Abuse Cases: A Path to Success. The series is produced by MD Magazine, a portal that provides physicians with clinical news, information, and resources designed to help them provide better care to patients. In the series, Charlier, Barbour, and other experts discuss an array of issues around drug treatment and medication-assisted therapies in justice and reentry settings. The Data-Driven Justice Initiative (DDJ) is a coalition of over 100 cities, counties, and states that have committed to employing data-driven strategies to divert individuals out of the justice system and into care, with a specific focus on the small percentage of people with substance use and/or mental health disorders who account for a disproportionate amount of health and justice resources. This groundbreaking effort is merging the fields of big data and criminal justice reform. Working with the National Association of Counties, TASC is providing technical assistance to the State of Illinois and five small-to-medium counties outside of Illinois as they pursue their respective DDJ initiatives. TASC is helping these jurisdictions develop partnerships, identify core data sources, and plan for pilot programs to address local concerns. 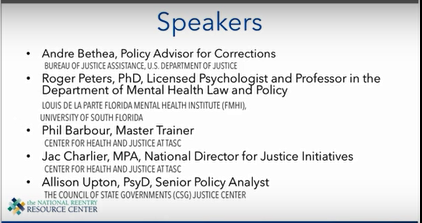 The Center for Health and Justice at TASC produced two videos to be used by local police departments during roll call to help law enforcement officers and leadership better understand the nature of addiction and improve community relations as a foundation for deflecting drug-involved individuals into treatment rather than arrest. This project was funded by the Office of National Drug Control Policy. Following recent consulting work to help initiate Baltimore’s Stop, Triage, Educate, Engage, and Rehabilitate (STEER) program, Charlier recently was quoted in the Wall Street Journal regarding the value of law enforcement deflection initiatives. “The policing world, through deflection efforts, is understanding that access to treatment and follow-up to treatment is a legitimate approach to public safety,” he said. Read more about TASC ‘s national work and other news here. (second from left) in MD Magazine Peer Exchange series.